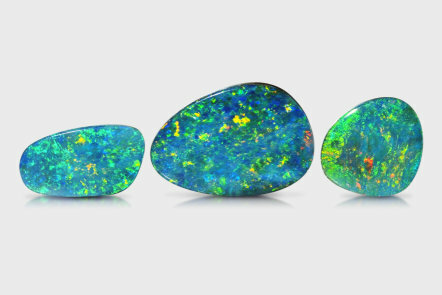 Opal Doublets are the best color value in Opals as they show the full color of the Opal. To create Opal Doublets, we use thin Opal layers and epoxy the Opal to an ironstone backing. We use a black epoxy to best show the color of the Opal. As doublets are an assembled gemstone, care should be taken to avoid ultrasonic cleaners and soaking in water or steam. It is recommended to treat them as carefully as pearls: last on in the morning and first out in the evening.